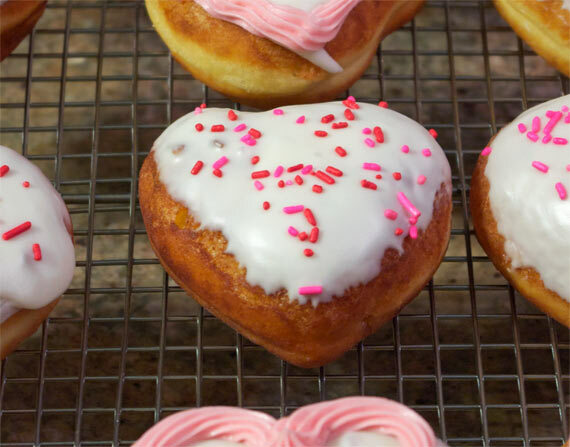 This year’s featured Valentine’s Day recipe is for heart-shaped, yeast-raised donuts with strawberry buttercream filling and vanilla icing. The secret ingredient is… as usual… love. I decorated some with sprinkles and others with a decorative pink icing that I made by simply combining the leftover filling with the leftover icing. I won’t sugar coat it. Raised donuts take time. All together, you’re into it for at least 3 hours, probably 4. Much of that is just waiting for dough to rise, but you can’t really hurry the process. Don’t be fooled by TV shows like “Donut Showdown” where gourmet filled donuts are made in under an hour. This recipe makes 16 donuts. In a cup, stir the malt syrup into the warm water (110 degrees) until it dissolves. Top with the yeast. Let it set for 5 minutes until foamy on top. Sift the all-purpose flour, soy flour, salt, baking powder and nutmeg together into a large bowl. Add the vanilla to the milk. In a stand mixer with a paddle attachment, cream the shortening and sugar together. Add the egg yolks one at a time – mixing on low – until well combined. Add the yeast/water mixture, the mashed potato and half of the flour. When mostly combined, add the milk and remaining flour. Mix on low until combined then switch to medium until the dough comes together and starts to pull away from the mixing bowl. Change to the hook attachment, knead dough for 2 or 3 minutes. Transfer the dough to a large mixing bowl that’s been coated with cooking spray. Cover loosely with plastic wrap and allow dough to expand to double its size – about 90 minutes. Turn the dough out onto a lightly floured surface. Dust the top with flour. Roll to 1/2-inch thickness. Cut out the donuts and transfer them to a parchment-lined baking sheet. Let the donuts set until almost doubled in size – about 45 minutes. You can tell the donuts are ready for frying when you poke one gently with your fingertip and it holds the indentation. If the dough bounces back quickly, let the donuts rest for a few more minutes. Fry in batches in 3 inches of hot canola oil (360 degrees). Fry one side to golden brown (about 1 minute). Flip and cook other side to golden brown (about 50 seconds). Transfer cooked donuts to stacked paper towels. Allow them to cool completely before filling. In a large mixing bowl, mash the butter and powdered sugar together with a wooden paddle. 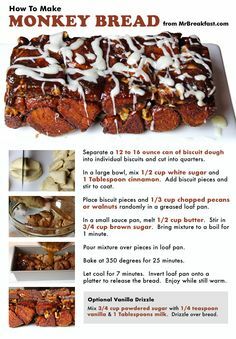 Add all remaining ingredients and beat on medium with an electric beater until fluffy and frosting-like – about 3 minutes. Transfer to a pastry bag with a long tip and fill the donuts. 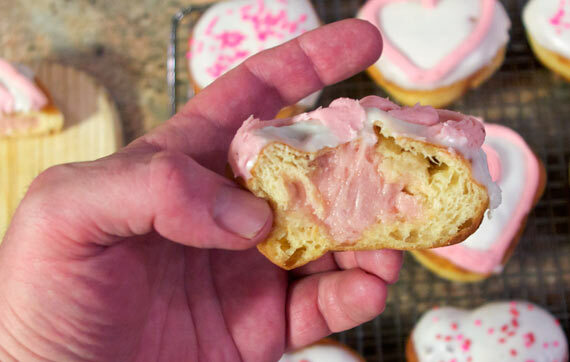 You could also pierce each donut with a paring knife and add the filling using a small stirring spoon. 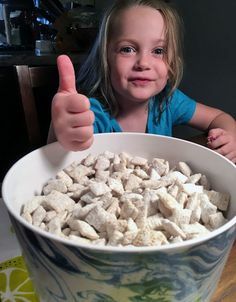 In a medium mixing bowl, combine the powdered sugar, vanilla and 3 Tablespoons of milk. Stir until a frosting like texture is formed. This may take nearly a minute. Add additional milk by the teaspoon to achieve desired constancy. Test by inserting a spoon in the bowl. The icing should coat it and drip off slowly like a thick syrup. I usually stir my icing in a bowl over a hot water bath. I find that the icing comes together more easily without having to add as much milk. 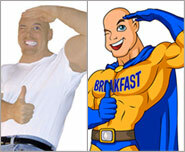 That equates to icing that firms up faster and firmer on the donuts. Dip the tops of the cooled, filled donuts into the bowl of icing. Twist donuts as you remove them to coat completely and to help the excess icing drip away. 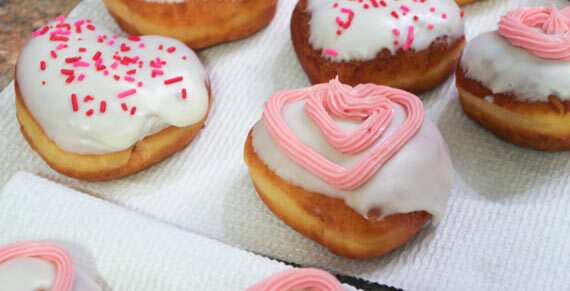 Place the donuts on a wire rack and allow the icing to set. 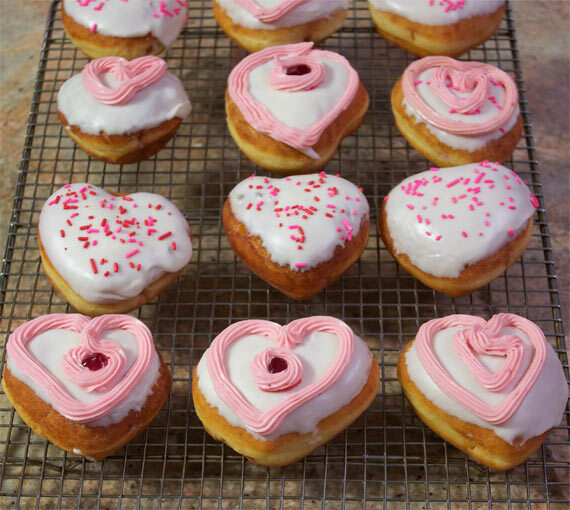 If adding sprinkles, do that as soon as the donuts are iced and well before the icing has a chance to set. I went rogue for this part and didn’t use any recipe. 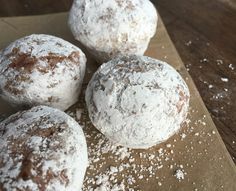 I simple combined my leftover filling with my leftover icing and stirred in more powdered sugar until the consistency was just a little thicker than softened butter. Then I transferred the mixture to a piping bag with a thin tip to decorate. 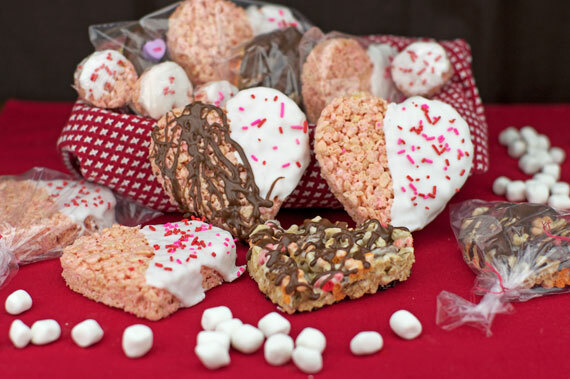 Last Valentine’s Day, I made Heart-Shaped Breakfast Cereal Treats, including classic Rice Krispies-style treats and others made with random breakfast cereals. You can revisit that post right here. What did the icing say to the donut? Answer: I’m sweet on you. I’m sweet on you for reading this post. Happy Valentine’s Day Everybody!